Washington rushed for four yards on one carry in Sunday's 42-28 loss to the Colts. 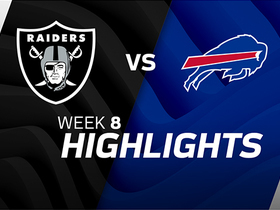 Analysis: Washington made an appearance on just two offensive snaps during his 2018 season debut, while fellow running backs Doug Martin and Jalen Richard combined for 25 total touches. Both Martin and Richard averaged more than five yards per carry, so expect another limited role for Washington in Week 9 against the 49ers on Thursday night. Washington is expected to make his 2018 debut Sunday against the Colts, Michael Gehlken of the Las Vegas Review-Journal reports. Analysis: Washington spent the first couple weeks of the season recovering from arthroscopic knee surgery before becoming a consistent healthy scratch since late September. 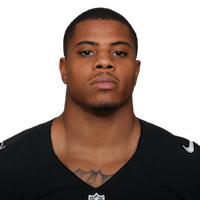 Expect this to change Week 8 with Marshawn Lynch (groin) having landed on IR, leaving Doug Martin and Jalen Richard at the top of the running back depth chart. Washington is by no means in line for a significant amount of touches, but an injury to Martin or Richard would diversify the former's role in a struggling offense. Washington (coach's decision) is listed as inactive for Sunday's game against the Dolphins, the Raiders' official site reports. Analysis: Washington was removed from the injury report this past week after recovering from arthroscopic knee surgery, but he'll be kept inactive Sunday as Marshawn Lynch, Doug Martin and Jalen Richard handle the backfield duties. 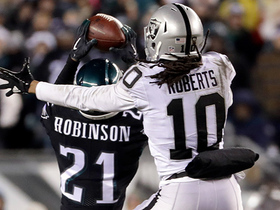 Washington (knee) isn't listed on the Raiders' injury report, Matt Schneidman of The San Jose Mercury News reports. Analysis: Washington was inactive for the Raiders' first two games this season while recovering from arthroscopic knee surgery. His absence from the injury report suggests he has likely made a full recovery at this point, setting the stage for him to potentially make his season debut Sunday against the Dolphins. Given that he's fourth on the depth chart at running back, however, Washington may be at some risk of another inactive status in a coach's decision. Washington (knee) is inactive for Sunday's Week 2 tilt against the Broncos. 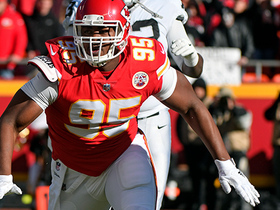 Analysis: The change-of-pace back has apparently failed to make sufficient progress from offseason surgery, although he at least made a return to practice this past week. Jalen Richard, who particularly excelled in the passing game during the Week 1 blowout defeat to the Rams, will once again serve as the complementary option behind Marshawn Lynch and Doug Martin. 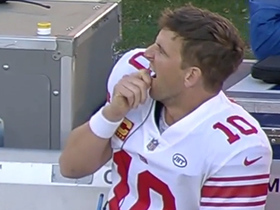 Washington (knee) is questionable against the Broncos on Sunday, Matt Schneidman of The San Jose Mercury News reports. Analysis: Washington is still recovering from offseason arthroscopic surgery, but managed to return to practice this week. It remains to be seen whether Washington will play Week 2, but he'll have minimal fantasy relevance behind Marshawn Lynch, Doug Martin and Jalen Richard even if he does suit up. Washington (knee) returned to practice Wednesday as a limited participant, Matt Schneidman of The San Jose Mercury News reports. Washington (knee) will be absent from Monday's season opener against the Rams, Matt Kawahara of the San Francisco Chronicle reports. Analysis: Washington is recovering from arthroscopic surgery this offseason. He was unable to return to practice this week, so it is no surprise that the team has ruled him out for the opener. Doug Martin and Jalen Richard are ahead of him on the depth chart in backing up Marshawn Lynch anyway, so Washington figures to provide depth and not much more once he returns. Washington (knee) was a non-participant in Thursday's practice, Michael Gehlken of the Las Vegas Review-Journal reports. Analysis: Washington underwent arthroscopic surgery earlier this offseason to address a knee injury sustained in training camp, and appears to still be recovering. The 25-year-old seems likely to sit out Monday's season-opener against the Rams, and should begin the season behind Marshawn Lynch and Doug Martin when he does return to the field. As long as Washington remains sidelined, fellow running back Jalen Richard will handle No. 3 duties uncontested. Washington (knee) is expected to resume practicing in the near future, Scott Bair of NBC Sports Bay Area reports. 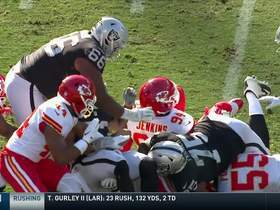 Washington (knee) has a spot on Oakland's initial 53-man roster, Michael Gehlken of the Las Vegas Review-Journal reports. Analysis: Washington had arthroscopic surgery in mid-to-late August, but it wasn't enough to put him on the wrong side of roster cuts. He'll likely compete with Jalen Richard for a minor pass-catching role once he's healthy, while Marshawn Lynch and Doug Martin figure to get most of the carries. Washington recently underwent arthroscopic to address a lingering knee issue, Michael Gehlken of the Las Vegas Review-Journal reports. Analysis: Washington likely will miss the rest of the preseason, but head coach Jon Gruden suggested the knee injury won't kill the 25-year-old's chances of making the 53-man roster. Washington is competing for one or two spots in the backfield along with Jalen Richard and undrafted rookie Chris Warren. Washington isn't practicing Wednesday due to a knee issue, Vic Tafur of The Athletic Bay Area reports. Analysis: The timing of the injury couldn't be much worse for a player on the roster bubble. Washington is competing with Jalen Richard and Chris Warren for one or two spots in the Oakland backfield. Washington ran for 38 yards on six carries during Friday's preseason win over the Lions. Analysis: Washington, who averaged 6.3 yards per carry Friday, also forced two missed tackles in just six rushes and had 5.3 yards after contact per attempt according to Pro Football Focus. Washington is entrenched in a four-man battle for three roster spots at running back behind starter Marshawn Lynch, with Doug Martin, Jalen Richard and Chris Warren on hand as Washington's competition. Washington (personal) retook the field for practice Tuesday, Michael Gehlken of the Las Vegas Review-Journal reports. Analysis: Washington temporarily left the team last week to tend to a personal matter, but he rejoined the fold Tuesday and should return to a battle with Jalen Richard for the third-string role behind Marshawn Lynch and Doug Martin, with rookie Chris Warren also aiming for a roster spot. Washington has missed the past three days due to a personal issue, Vic Tafur of The Athletic Bay Area reports. 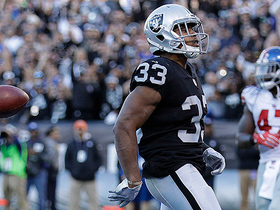 Analysis: An extended absence for Washington could allow Doug Martin and Jalen Richard to become the favorites in the backup running back battle behind starter Marshawn Lynch. 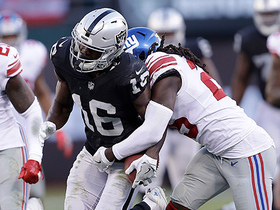 The nature of Washington's personal issue is currently unclear, but he'll hope to return in time for the Raiders' preseason opener against the Lions on Friday as he races stiff competition with rookie Chris Warren also pushing for snaps. Washington is part of a deep Oakland backfield, with Marshawn Lynch, Doug Martin and Jalen Richard also on the roster, Doug Williams of NBC Bay Area reports. Analysis: Lynch is locked in as the Week 1 starter, but he'll likely give way to Washington or Richard on passing downs, and Martin is also in the mix to earn a role. Washington could lose his roster spot if he doesn't win the passing-down job, after averaging just 2.7 yards on 57 carries and 5.8 yards on 34 catches last season. Washington, Richard, Martin and undrafted rookie Chris Warren may end up competing for just two spots. Washington rushed for three yards on two carries and caught two passes on three targets for no gain in Sunday's 30-10 loss to the Chargers. 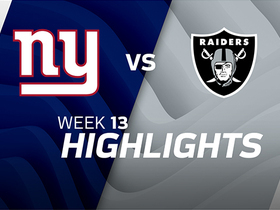 Washington rushed for a loss of three yards on one rush and caught one pass on three targets for two yards in Monday's 19-10 loss to the Eagles. Analysis: Washington continues to struggle on the ground as he's now totaled just 55 yards on 22 carries in six games since the Raiders' bye week. 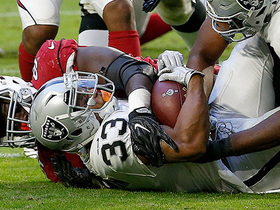 Despite logging less offensive snaps than Washington, fellow backup Jalen Richard was much more productive behind starter Marshawn Lynch on Monday night, racking up 56 total yards on just six touches. Washington will have one last chance in Week 17 against the Chargers to gain any sort of momentum heading into the Raiders' offseason. Washington rushed twice for three yards and caught two passes on three targets for 16 yards during Sunday's 20-17 loss to the Cowboys. Washington rushed four times for nine yards and added one reception on two targets for 10 yards in Sunday's 26-15 loss to the Chiefs. Analysis: Washington logged just 14 offensive snaps for a third consecutive week as starter Marshawn Lynch led the Raiders' backfield with 61 yards and a touchdown on seven carries. Washington has now averaged less than 4.0 yards per carry in four straight games, while his fantasy relevance remains limited to deeper leagues heading into a Week 15 matchup against the Cowboys. Washington rushed for 16 yards and a touchdown on six carries during Sunday's 24-17 win over the Giants. Analysis: Washington failed to record a single reception for the first time since Week 4 and rushed for a dismal 2.7 yards per carry against the Giants, but he notched his second rushing touchdown of the season to salvage any fantasy relevance. Washington also out-paced fellow backup Jalen Richard in terms of touches, as the latter logged just one carry for four yards to go along with a five-yard reception. Washington rushed for 23 yards on six carries to go along with three receptions on as many targets for 23 yards during Sunday's 21-14 win over the Broncos. Analysis: Washington logged nine more offensive snaps than fellow backup Jalen Richard against Denver, but the latter found the end zone for his second touchdown of the season on a six-yard reception. 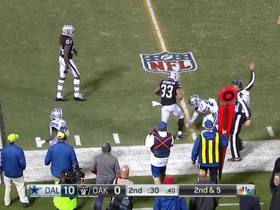 The Raiders turned to starter Marshawn Lynch to milk the clock in the second half after jumping out to a 21-0 lead in the third quarter. Washington remains firmly behind Lynch in terms of opportunity at this point, while Richard figures to continue earning several touches per week as well. Washington rushed for seven yards on three carries and caught two passes for 12 yards on three targets during Sunday's loss to the Patriots. Washington rushed for 16 yards on four carries and lost two yards on a reception in Sunday's 27-24 win over Miami. Analysis: With Marshawn Lynch ejected from Oakland's Thursday might matchup against the Chiefs and then suspended against Buffalo, Washington enjoyed 26 total touches and scored in each game. If there was much doubt what his role would be with Lynch's return, Sunday answered them as Washington saw the field for just nine offensive snaps. He has some value as a receiver out of the backfield, but hasn't shown the big-play ability he flashed as a rookie in limited touches this season.